This post explains how to create Extract URL Data Like Facebook Using PHP, jQuery and Ajax. Basically in the URL Extraction we are retrieving the Meta Tag details from the webpages, which is available in the Head Tag. From the Meta Tag we are picking up some important information like Title, Description, Images and some URL. If you have observed the most the company like Facebook, Twitter, Google, LinkedIn etc using this link extraction technique in their webpages. In another word this extraction technique is also called as web scraping. Web Scraping refers to an application that processes the HTML of a Web page to extract data for manipulation such as converting the Web page to another format (i.e. HTML to WML). Here in this post we have provided a simple example to Extract URL Data and also it gives you ideas how to get the cross domain data with jquery and ajax. lets see the below source code and clear you understanding step by step. When user provide any URL details in text-box field and hit the enter button, then it will send the (Ajax)request to "fetch_url.php" page with the help of jQuery script as Keyup event listener attached to text- box field. After that it will extract meta tag details from the "fetch_url.php" page without any page refresh. manipulating the meta tag details and displaying the results HTML format. Below code helps Facebook Like Extracting URL Data with Jquery and Ajax. This source code helps to extract information form the webpage based on the request link. This helps to extract information like Title of Page, Page description and image from webpages. 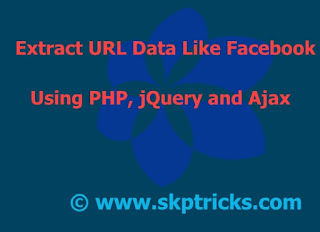 This is all about the Extract URL Data Like Facebook Using PHP, jQuery and Ajax tutorial. Any case of any query/suggestion please do comment below. Check your php.ini file. If you are using shared hosting, create one first. Could you let us know what is exactly happening ?